Every no-hitter has that one dramatic moment that underscores just how difficult a task the pitcher is facing. For Nick Tepesch, that moment came after he had done everything he could to finish what he started. Tepesch pitched a career-high 7 1/3 innings and Jimmy Reyes recorded the final five outs Saturday night as the Class A Advanced Myrtle Beach Pelicans no-hit the Wilmington Blue Rocks, 3-0. Tepesch (2-3) recorded a season-high nine strikeouts, issued four walks and threw a career-high 115 pitches. He left in the eighth after walking two and uncorking a wild pitch. "It was the most pitches I've thrown all year by 15 or so," the 23-year-old right-hander said. "I'm sure that had something to do with it. I wish I could have stayed out there, but that's part of it." Reyes entered with runners on the corners and one out and got Alex McLure to hit a grounder to second baseman Santiago Chirino, who started an inning-ending double play. Reyes, a 23-year-old southpaw, fanned two in a perfect ninth. "I wasn't feeling any more pressure than I would. I never like to give up a starter's runs," he said. "I was pretty excited because I knew that I had fallen behind and knew that I had to make a good pitch. It was awesome to get out that jam." 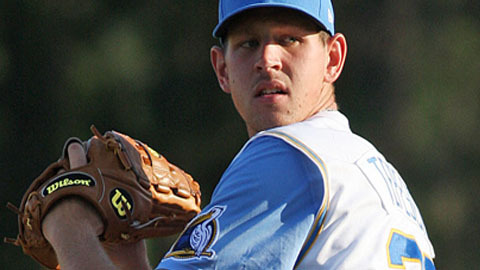 Selected by the Rangers in the 14th round of the 2010 Draft, Tepesch retired the first 11 Blue Rocks before walking Brian Fletcher with two outs in the fourth. The University of Missouri product settled into another groove, stringing together nine straight outs before Brett Eibner drew a free pass with two outs in the seventh. "I was locating my fastball and I was commanding all my pitches," Tepesch said. "My command was really good, minus the two walks in the eighth. The curveball was real good, I was locating my pitches where I wanted and my defense was picking me up." While Reyes was thrilled to take part in a no-hitter, he was even happier for his teammate. "More than anything, I was relieved that Tepesch could enjoy his moment," Reyes said. "I would hate for him to leave the ballpark without having that moment." It was the second no-hitter in Pelicans' history. Tim Spooneybarger and Christian Parra combined on a seven-inning gem against Frederick on July 23, 2000. The magnitude of the feat still hadn't hit Tepesch, who tried to keep an even keel during the ninth. "I'd probably be lying to you if I said I wasn't nervous a little bit," Tepesch said. "There was definitely emotion there. I just tried to look at it as any other ninth inning. It hasn't really set in too much, it's still kind of setting it a bit, but it's a great feeling." It was the sixth no-hitter in the Minor Leagues this season and the first in the Carolina League since Kinston's Marty Popham, Chris Jones and Cory Burns combined to throw 10 hitless innings against Potomac on Sept. 5, 2010. For a reliever like Reyes, the no-hitter was something to savor -- for one night. "It's great to enjoy and I'm going to think about tonight and move on tomorrow," he said. "Tep's got a few days to let it soak in, but I have a day. I have to be ready to pitch tomorrow." Brett Nicholas gave the Pelicans all the runs they needed with a two-run double in the sixth. Tomas Telis was 3-for-4 with a pair of doubles and two runs scored. Jason Adam, the Royals' No. 12 prospect, fell to 1-6 after allowing two runs on six hits over six innings. He fanned seven for the Blue Rocks, who were on the losing end of a nine-inning no-hitter for the first time in team history.